WE ALWAYS MAKE SPRITZ COOKIES AND SAND TARTS. THE SAND TARTS ARE FROM A RECIPE FROM MY HUSBAND'S FAMILY. DEPENDING ON YOUR HERITAGE, YOU EITHER SLICE THESE COOKIES OR ROLL THEM OUT AND CUT THEM. AS YOU CAN SEE WE ARE THE SLICING KIND OF FAMILY. 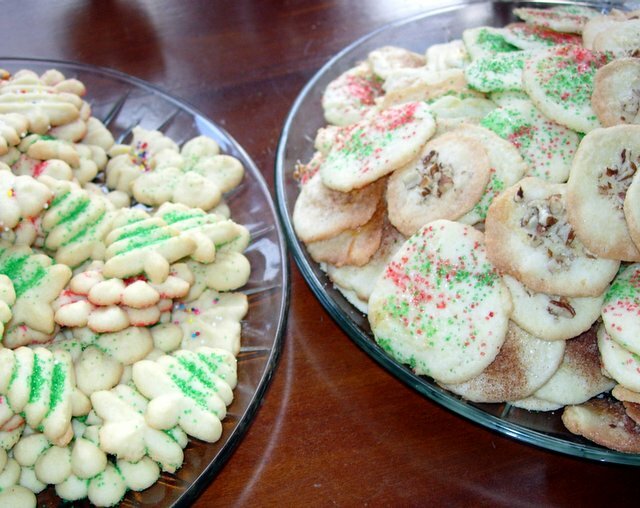 THE SPRITZ COOKIES AND GINGERBREAD ARE TRADITIONS WE STARTED WHEN OUR GIRLS WERE LITTLE.